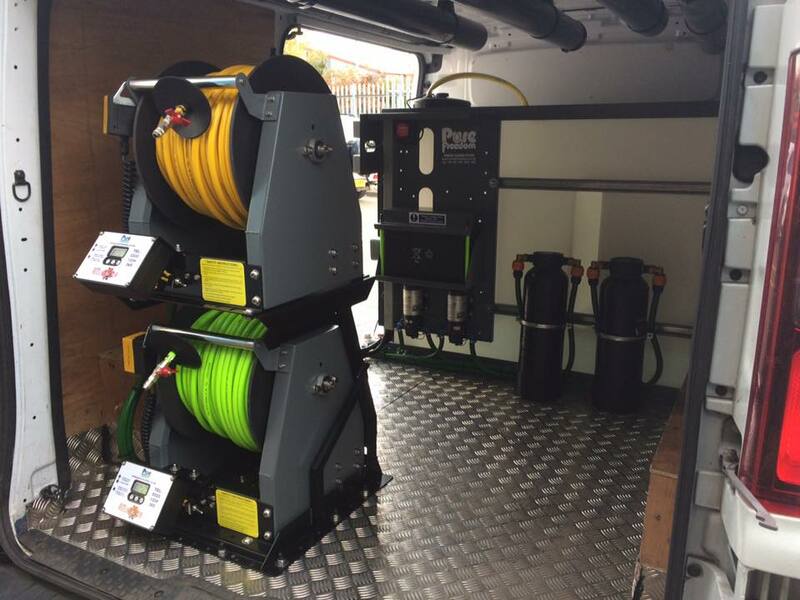 Pure Freedom Water Fed Pole Van Systems offer extremely good value for a professionally built and installed water fed pole system. Designed, fabricated and assembled entirely by us, in house with 29 years in the engineering industry, you can rest assured that your system will give you years of trouble free service and be an asset to your business. 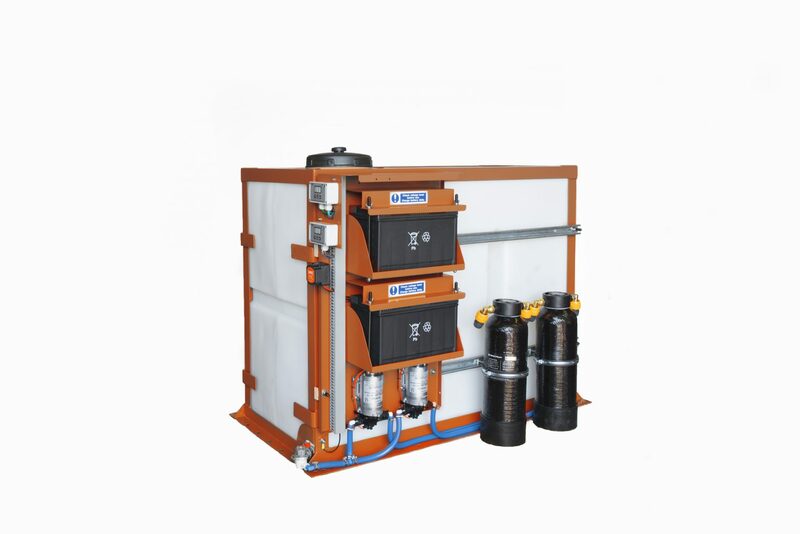 System Sizes: 250ltr, 350ltr, 400ltr, 500ltr, 650ltr, 800ltr, 1000ltr. Adepta Engineering Ltd. trading under the Pure Freedom brand has now supplied water fed pole van systems for 15 years. We believe it is one of the most easy and cost effective ways to get up and running with a WFP window cleaning system. With 29 years of engineering experience behind us we can supply and fit all kinds of bespoke water fed pole van systems and we pride ourselves on our ability to produce equipment for a specific customer and a vehicle. We produce and fit water fed pole tank systems in all sizes and shapes of van from ‘car style’ vans to large Transit type vans, crew cabs and pickup trucks and trailers. We build and test the systems before fitting and in most cases your system will be installed by us in one day, ready to work the next, allowing you to be out working and earning as quickly as possible. Our systems are built to our crash tested design and fitted by our own engineers so your insurance company will like that. Hand fabricated in the UK by our own experienced in-house engineers. Powerful 100psi industry leading pumps – will easily handle poles up to 80ft 100mt away. Digital Flowmaster electronic pump controllers featuring dead-end (stopped flow) detection, 100 flow rate settings, battery voltage readout, and easy operation. Heavy duty 110 amp-hour battery. Crash Tested Stainless Steel Securing Cage Securely Bolted Through Vehicle Chassis. Optional Full training with a professional City & Guilds qualified window cleaner for water fed pole and traditional window cleaning, while your van is fitted. All fixtures and fittings and a professional trouble free installation at our factory in one day. Everything taken care of from start to finish. From day one our systems have been fitted with the utmost emphasis on safety and ensuring that the water tank and other components are secured properly in the vehicle. All of our van systems are constructed around a stainless steel mounting frame and are installed securely to the chassis of your vehicle. We believe this is extremely important to prevent the water tank and other system components from entering the cab in the event of heavy braking or an accident. Back in 2012 we successfully crash tested one of our 1000 litre systems at 30 mph. The result was that the van was heavily damaged however the system remained securely in place in the back of the vehicle as we had expected, with very little deformation or damage. Major components are stamped with a unique security code which is difficult to remove and shows any attempt at tampering or destruction. Serial numbers of individual parts of the system are carefully recorded so that even if the system is broken down stolen parts can still be identified and recovered. Systems have clearly visible security labels affixed and security stickers are placed in vehicle windows to deter potential thieves. Reported thefts are recorded and we liaise with authorities to recover stolen goods as soon as possible. We are pleased to be able to offer rental/lease agreements on our systems which give you the right to use equipment owned by the finance company for a fixed period of time in return for regular payments (rental payments). You are responsible for the maintenance and insurance of the equipment. All payments (rentals) are 100% tax allowable as a business expense for tax relief, often providing substantial tax savings for the business. Leasing effectively allows you to buy at today’s prices out of tomorrow’s income. This allows you to purchase equipment that is important to your business and keep your valuable cash that may be used for other projects or simply as emergency funds. Payments are fixed for the term of the agreement. Customers are protected from changing interest rates – enabling accurate budgeting and cash flow projections. A lease allows the business to get what it needs and spread the cost – no need to be dictated to by available capital. Pure Freedom uses commercial finance brokers to help our clients find the right finance package to buy our water fed pole window cleaning equipment. We can source the best rate, terms, and type of finance available in the market. There is no extra charge for arranging your finance. We firmly believe that having the correct equipment built from high quality components is essential to minimise your downtime and allow you to achieve the full potential of water fed pole window cleaning. We take the time to discuss your needs in real depth. We try to discover as much as possible about your individual workload which allows us to design your system to your unique requirements. We agree a plan and a date for fitting with you and after a small deposit of around £200 has been taken we will put this plan into action and begin building your system in our workshops. Normally we will send you a Protecta-Kote kit for you to waterproof the inside of your van prior to the fitting date, this then allows us to fit your system in one day (but please note that in exceptional circumstances a fitting may run in to two days). If you wish we can water proof your van too but we will need the vehicle at our premises for up to 3 days. On the date of installation we will agree on the best position of the system in your vehicle, and commence the fitting, during this time we can arrange for you to go out for training with City & Guilds qualified window cleaner. Once your system is fitted and thoroughly tested, we will take you back to our workshops and talk you through the whole system answering any queries you may have. At this point once the pure water has been produced, you are ready to begin working, which is usually the very next day. This of course, is not where it ends – our support staff and technicians are available by e-mail at sales@purefreedom.co.uk and by phone on 0333 1234 365 Mon-Fri 8am to 5pm, should you require any assistance spares or advice from day one to many years down the line.